The Delaire Graff The View Chenin Blanc 2017 was exclusively produced for CAPREO by Morné Vrey. The result: An elegant and balanced wine, which scores with its fresh and fruity notes of white peach and ripe pear. The oak matured white wine entices with its great structure and is a versatile meal companion to refined salads, fish or pasta. 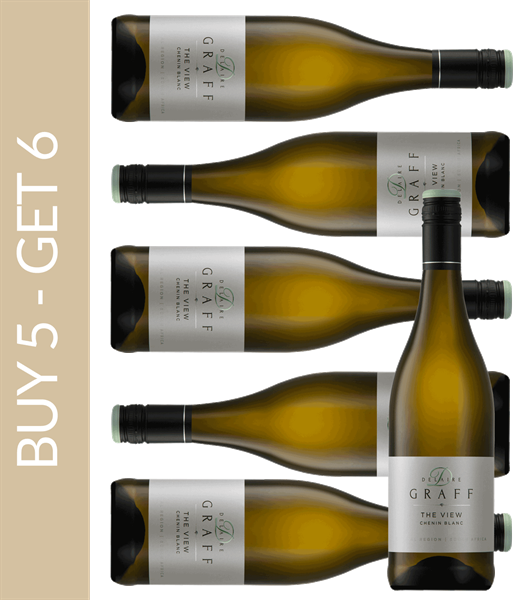 Discover our wine of the month and use our offer: when you buy five bottles of Delaire Graff The View Chenin Blanc 2017, you get one bottle for free. The offer is limited in time until 30.04.2019 and, as always, only valid while stocks last. Matured in French oak for ten months. None other than the famous wine critic John Platter had once owned the estate Delaire Graff, back then known under the name Avontuur, and had created outstanding premium wines in the 1980s here. The change of name goes back to the partly breathtaking sights that the farm offers. An almost magical view of the valley of the Helshoegte Pass inspired the owner at that time to the name Delaire Estate. When translated, Delaire means ‘from heaven’. In 2003, Laurence Graff took over the winery and started converting it into one of the most important destinations for art enthusiasts, luxury vacationists and wine lovers. Laurence Graff is a diamond and jewellery trader himself and is familiar with the premium and luxury sector. The same can surely be said for the wines from Delaire Graff. The team at Delaire Graff has managed to become the flagship for South African wine in the shortest amount of time. Winemaker Morné Vrey and his employees focus on a gentle harvest of exclusively noble grapes in order to get the best basis possible for the wines. A very special bottle is the red wine Botmaskop. Like no other wine it stands for the strength of South African red wines, paired with the elegance and splendour Laurence Graff is well-known for. There are some wine enthusiasts who think if you were to drink one wine from South Africa only, then it should be the Botmaskop. Visitors of Delaire Graff can experience an all-round package with a noble spa area and stylishly furnished hotel suites. But the highlights are the two restaurants that are directly at the winery. The Delaire Graff restaurant stands for fine dishes that captivate with wonderful aromas and creative ingredients. The winery also offers the Indochine restaurant. Here, the gourmet can find mainly Asian cuisine, freshened up by modern influences. Together with the wines from Delaire Graff, a holistic, noble taste sensation is created.